When Smithfield Foods opened its pork processing plant in Tar Heel, North Carolina, in 1992, workers in the rural area were thrilled to have jobs at what was billed as “the largest slaughterhouse in the world.” However, they soon left in droves because of the fast, unrelenting line speed and high rate of injury. Those who stayed wanted higher wages and safer working conditions, but every time they tried to form a union, the company quickly cracked down, firing union leaders, assaulting organizers, and setting minority groups against each other. Author and journalist Lynn Waltz reveals how these aggressive tactics went unchecked for years until Sherri Buffkin, a higher-up manager at Smithfield, blew the lid off the company’s corrupt practices. Through meticulous reporting, in-depth interviews with key players, and a mind for labor and environmental histories, Waltz weaves a fascinating tale of the nearly two-decade struggle that eventually brought justice to the workers and accountability to the food giant, pitting the world’s largest slaughterhouse against the world’s largest meatpacking union. 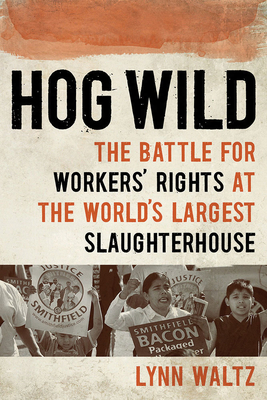 Following in a long tradition of books that expose the horrors of the meatpacking industry—from Upton Sinclair’s The Jungle to Eric Schlosser’s Fast Food Nation—Hog Wild uncovers rampant corporate environmental hooliganism, labor exploitation, and union-busting by one of the nation’s largest meat producers. Waltz’s eye-opening examination sheds new light on the challenges workers face not just in meatpacking, but everywhere workers have lost their power to collectively bargain with powerful corporations. Lynn Waltz is an assistant professor of journalism at Hampton University in Hampton, Virginia. Twice nominated by The Virginian-Pilot for the Pulitzer Prize, she has been a professional journalist for more than twenty-five years.